Ever know someone, or read about a quality a person has, and your thoughts go to “I want summa THAT’, I want what they have.” I recently had those thoughts, not in a jealous way, but a ‘divine gotta have’ way. In my study time I came across a very gutsy gal. Mark 5:24-34, the woman with the bleeding issue. Oh I know, when we get to this area of scripture, due to the ‘topic’ we may tend to skim fast over it, yet it has AMAZING lessons for us. Verse 25 describes this gal as one who had been afflicted for a very long time. She had sought help elsewhere, yet instead of improving, her condition worsens. I love verse 27, “When she heard about Jesus, she came…” One resource claims that she may have traveled some 30 miles to get there. As I read through this, I felt the Lord say that I too am (we all are) like G.G. at times (I nicknamed her Gutsy Gal) We may not have a physical ailment, but we have issues, stuff, we can be lost in our own affliction, and be there a LONG time, seeking help elsewhere. What will it take to bring us to the realization that He will help us. Do we have the faith to come to Him and not stay away. Confidently reach for Him and KNOW He will meet us in our need. It may take some gutsiness on our part, some faith reaching, strong grabbing, and by golly don’t worry about the crowd … JUST COME TO JESUS! This entry was posted on May 1, 2011 by Inspired Fountain. 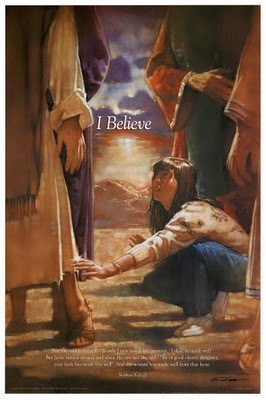 It was filed under * Miscellanous Stuff and was tagged with Gutsy faith, Touch Jesus' hem.